Happy WOYWW! Let me first say, I am off to Jury Duty today so please don’t hesitate to comment, I will respond tomorrow. I hate Jury duty but such is life! I am going to bring my e-reader and some snacks and wait it out. 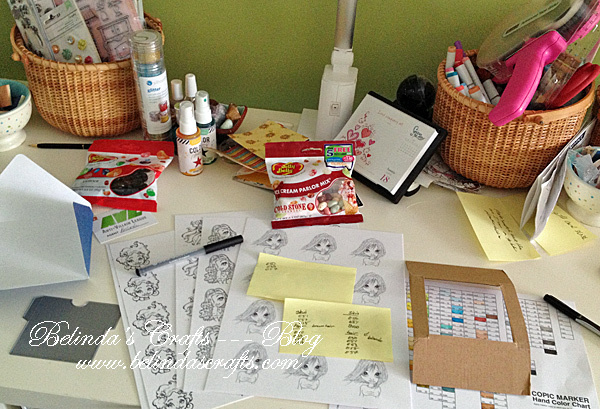 The happenings on my desk today! So I have decided to actually take vacation the rest of June and in August when the boys are out of summer camp and we play. I don’t want to be feeling guilty for not creating more products for my Etsy store so I am setting my vacation time. Otherwise I will beat myself up for not doing it. Having said that, I have decided to work on personal projects and improving my crafting techniques during this off time. So on my desk you will see the beginnings of a color study I am developing. I tend to color up a lot of digital and rubber stamps of people. One of the challenges with Copics is getting the hair and skin to look more realistic. So I dug through my digis and found various ethnic and hair types to practice color combinations. When I find ones that I like I will be creating a little color combo book that I can reference on future projects. On the left you can see my MFT die for gift cards. I haven’t used it yet but thinking if I put it out there, I might. On the right you can see some cardboard from a package. I decided to keep it because it looks like the shape of a Polaroid and I thought I could make something cute with it. You can also see some new Jelly Beans my son and I are going to try out – Ice Cream Parlor mix. Should be interesting. I typically eat Jelly Beans when I craft so we thought we would try something new for fun. I say we because the boys walk by my craft table and help themselves from time to time. In the basket on the left you can see a few new American Crafts brads I bought. They are so pretty. Can’t wait to see if I actually part with them. In the middle of the desks you can see the remaining teacher gifts I have to finish assembling. I plan on delivering them next week which is the last week for the boys. I also wanted to share a photo of my first sympathy card. I typically make birthday, holiday and ordinary day cards so this is my first take on a sympathy card. I couldn’t find a stamp in my stash that had sympathy sentiments. So I used my thinking of you sentiment. I am sending it to a family member that recently lossed a loved one. This is my first easel card. I went on Youtube and found great tutorials, picked one and got to work. I also used my new We R Memory Keeper’s envelop maker to make the matching envelop. Well I am off to jury duty. I will reply to comments and visit your sites tomorrow. So don’t hesitate to drop a comment. 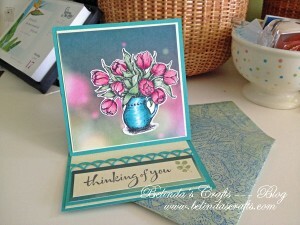 That is a lovely card and nice to see the colours you have chosen. Jelly beans, now that’s a plan! Good that you’ll get in some reading time during jury duty! My daughter is getting called in a lot for that. Enjoy your time off with your family! I rarely use the words ‘in sympathy’ on those cards anyway, there’s so much else you can say, and ‘thinking of you’ is probably really close to what really needs to be said. Good for you in your decision to ‘take’ holiday, and then to use it to learn stuff, impressive. Enjoy the colouring, lessons ornot!